The Notecards are Here! And there's a Holiday Sale - 15% OFF! The last couple months have been a whirlwind, and I totally neglected to post pictures of the brand new notecards I had printed last month! Thanks to some of you kind readers who voted, I gathered the images with the most votes and had them offset-printed by the very amazing James River Press, in Richmond, VA. Brooke was my contact for this project, and she was wonderful to work with! I also want to give a shout-out to my aunt who helped me a LOT through the process of deciding to print my notecards. She has always wanted me to create notecards of my artwork because it's an affordable way for people to own my art, as well as a great way for me to sustain a living income while having time to create more artwork (let's hope she's right about that!) She gave me so much encouragement and practical advice for embarking on this notecards business. Thank you! And my cards all packed up in cardboard boxes - 20,000 cards total! That's the largest quantity of my artwork ready to be put out into the world! I have a SALE going on in my shop through Sunday, December 15th, so you can get some cards for yourself with a 15% DISCOUNT! Please use coupon code YAY2013 upon checkout in my shop Sprout Head. You must use the coupon code, otherwise you won't receive the discount! I'm selling the cards individually, as well as in discounted packs. 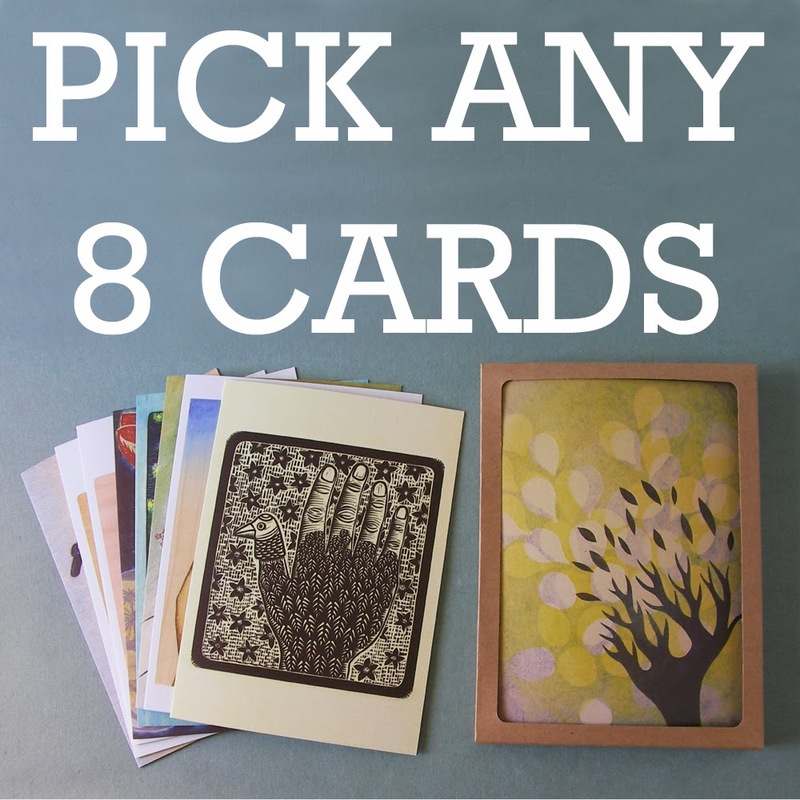 The image on each card is printed on a matte recycled paper which gives the artwork a beautiful, soft finish. 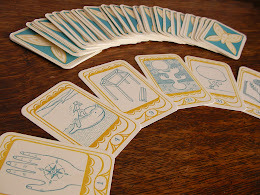 The back of the card lists the title and medium of the original artwork. 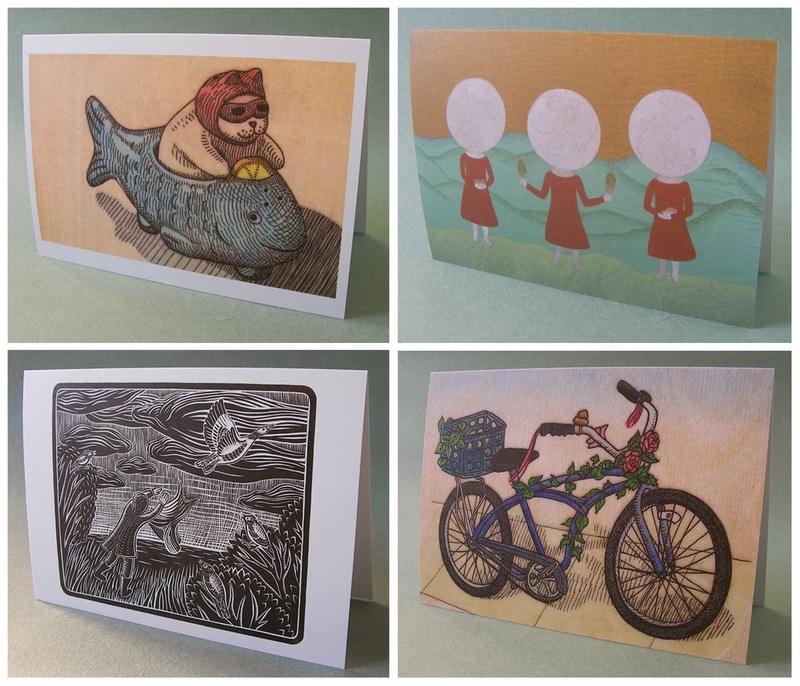 These cards are suitable to write your own greetings inside to give away, or you can choose to frame them as prints. The 5 x 7" card is a standard size for a ready-made frame. If any of you dear readers know of a shop where my cards might make a good fit, please leave a comment with the shop name and their website if they have one. I'd like to get my cards into many shops around the country. Yay! I swear I didn't peek when I picked the slip of paper with her name on it, but I felt very pleased to have picked my teacher from the online Children's Book Illustration class at UCSD Extension I took earlier this year. You can also read her blog Got Story Countdown, a great blog with advice for illustrators. Joy, I'll be e-mailing you very soon to ask for your notecard selections! I'm not sure if I'll have time to write another blog post before the end of this year, so if I don't I'd like to wish everyone Happy Holidays and a Happy New Year! Personally, this year has been challenging for me in both positive and negative ways. I've done a lot of evaluating of how I have been living/working/art-ing and how I would like things to grow or change. I realized that it's too difficult for me to keep up with all the different kinds of things I'm doing and I need to focus better and cut back on some activities while making more time to rest and rejuvenate. It's important for artists (and everyone) to have periods where not much happens, so they can be open to ideas and have the energy to embark on new projects. Some of the changes I want to see happen won't go into effect until several months into the new year because I've already made prior commitments. And some things are hard for me to change because I have trouble saying no to requests people ask of me, or putting on hiatus activities I'm already involved in. I'm trying to be more conscious of these tendencies and learn ways to be kind to myself so I can sustain the artistic life I want, while also being able to support myself materially. It's a difficult balance and a continual process. Maybe some of you are also going through a similar struggle. I wish everyone a bit more *peace* in their hearts so you can truly shine as the person you are.